Background: Flavobacterium columnare is the causative agent of columnaris disease, a disease affecting many freshwater fish species. Methods for the genetic manipulation for some of the species within the Bacteroidetes, including members of the genus Flavobacterium, have been described, but these methods were not adapted to work with F. columnare. Results: As a first step toward developing a robust set of genetic tools for F. columnare, a protocol was developed to introduce the E. coli – Flavobacterium shuttle vector pCP29 into F. columnare strain C#2 by conjugal mating at an efficiency of 1.5 × 10-3 antibiotic-resistant transconjugants per recipient cell. Eight of eleven F. columnare strains tested were able to receive pCP29 using the protocol. pCP29 contains the cfxA and ermF genes, conferring both cefoxitin and erythromycin resistance to recipient cells. Selection for pCP29 introduction into F. columnare was dependent on cfxA, as ermF was found not to provide strong resistance to erythromycin. This is in contrast to other Flavobacterium species where ermF-based erythromycin resistance is strong. The green fluorescent protein gene (gfp) was introduced into F. columnare strains under the control of two different native Flavobacterium promoters, demonstrating the potential of this reporter system for the study of gene expression. The transposon Tn4351 was successfully introduced into F. columnare, but the method was dependent on selecting for erythromycin resistance. To work, low concentrations of antibiotic (1 ug ml-1) were used, and high levels of background growth occurred. These results demonstrate that Tn4351 functions in F. columnare but that it is not an effective mutagenesis tool due to its dependence on erythromycin selection. Attempts to generate mutants via homologous recombination met with limited success, suggesting that RecA dependent homologous recombination is rare in F. columnare. 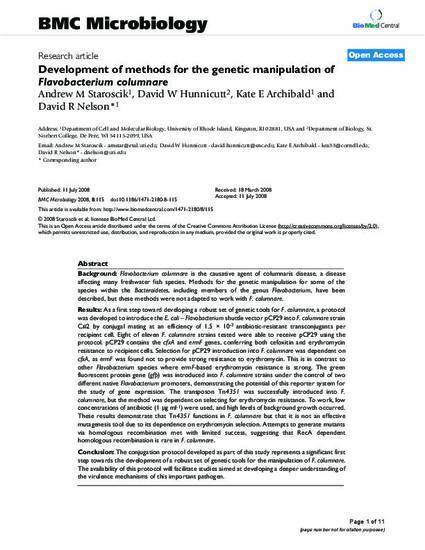 Conclusion: The conjugation protocol developed as part of this study represents a significant first step towards the development of a robust set of genetic tools for the manipulation of F. columnare. The availability of this protocol will facilitate studies aimed at developing a deeper understanding of the virulence mechanisms of this important pathogen.